Located on the edge of the Ocean this private villa is situated on 140 ft of pristine Baja coastline. 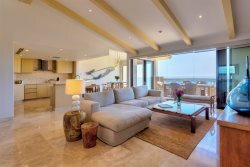 Live the ultimate Lifestyle with spectacular views of sunrises over the Sea of Cortez, unobstructed view of the “Arch of Cabo San Lucas” this property is located adjacent to the exclusive Auberge Esperanza Resort & Spa. Featuring two master suites, a king sized guest bedroom and a private guest casita with a king bed all within 3,300 A/C sq. ft. interior finishes include: marble flooring, Venetian-plaster walls, Rocky Mountain Hardware custom faucets and fixtures. Appliances are top of the line: Sub-Zero refrigerator-freezer, 6-burner Viking Gas Range, Viking professional BBQ, and wet bar with 20+bottle U-Line wine-cooler. The pool/patio area includes an infinity edge pool with an oversized oceanfront Jacuzzi, fire pit and outdoor dinning palapa and BBQ area, converged in a beautiful coastline.